1 Comment on Is Your Kids’ Diet Causing Indigestion? Indigestion is a concern in our family. K’s digestive tracts go wonky when he takes the “wrong” food (certain food cause bloatedness and backaches for him). My sister gets a regular episode of Irritable Bowel Syndrome (IBS), especially when anxiety comes knocking. And, neither am I spared from digestive issues. No thanks to constipation when I was younger, my dad had to administer stool softeners for me, and trust me, those memories are deep in my mind after so many decades. Not the best childhood memories! During both pregnancies, the condition worsened, and let’s just say it was a horrifying experience post-delivery with Leroy. While I diligently took probiotics during pregnancy and tried to limit my intake of laxatives, it’s an issue that I’ve been mindful of especially when it comes to our children. Genetics and constipation are related; just as the same for constipation and indigestion. As a mum, I’m definitely taking steps to prevent the same worries for my kids! So, how can we help our kids improve or maintain healthy digestive systems? To maintain a healthy gut health which aids in digestion, their diet plays an important role. Is our child’s diet causing constipation? 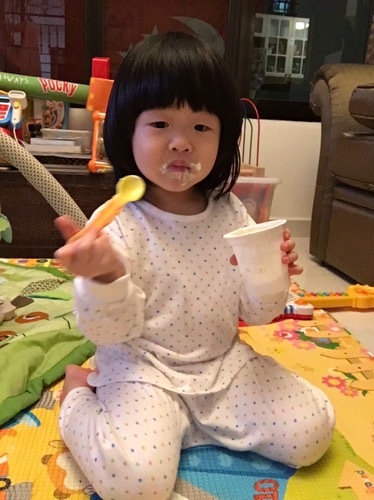 When Baby Vera first started solids at six months old, we noticed that certain food caused constipation for her. With that in mind, we are mindful that she does not take them too often, and ensures that she gets more fluids like milk, water or soup. Every child’s body reacts different to food, so this may take some trial and error for new parents to find out what may cause constipation for your kids. It's a cheesy Saturday! Finally bought the right cheese for baby Vera and hopefully she loves cheese like her mama😄 First time cubing food for her and she seems clueless not knowing if they should be eaten. Ended up putting them into her mouth for her and decided to cut them into strips which helped but by then she had already realized that being fed was an even better option😩 Luckily she likes them! Yay!! Common foods to avoid: ABC (Applesauce, Bananas and Cereals), white bread, cheese (sob!). Some mums find that potatoes may be harder to digest too, as they contain complex carbohydrates. Some traditional folks would say fried stuff too. Foods to take more of: Go for high-fiber content, to help loosen up your baby’s stool. Wholewheat pasta, brown rice, 4P fruits (Pears, Plums, Peaches, and Prunes) which can be in the form of whole fruit or diluted juices. Vegetables and fruit such as broccoli, peas, oats, guava, papaya. Some children may be more sensitive to certain food, so keeping a food diary can help mums monitor too! TIP: With additional fibre intake, it is important to increase fluids intake too, as fibre absorbs water. The combination of both helps to soften stools and move bowels through digestive tract. Eating yogurt aids in digestion, and helps to keep our little ones healthy! For children who are taking formula milk, it is common to hear that constipation arise, and when that happens, it may either take some time for your child’s body to accustom to, or, the formula isn’t suitable and that means trying different brands. A tummy-friendly formula can help improve digestion concerns. Friso’s LockNutri Process Technology, a mild heat treatment, is used in their formula to help preserve proteins in their natural form so it be easily absorbed by little tummies. That way, kids can benefit from the nutrients that they take too. For supplements, parents can seek advice from their child’s paediatrician or pharmacists for age-suitable supplements such as probiotics that can help with digestion. Child-suitable probiotics are also available at our local pharmacies, supermarkets and hypermarts. – offer slightly more fluids, but take note not to overfeed with water especially when baby is below one year old. Yup, parents have to walk the talk! Eat healthily, pay attention to what’s causing constipation for your children and help them find relieve when they experience constipation! If your little ones are still experiencing constipation after trying different methods, do consult a doctor for advice. As parents, we hope to give our best to our children’s health, so remember that we should take care of ourselves too!